The Journal of Vaishneva Studies (JVS) began as a small scholarly enterprise in 1992 and blossomed into one of Hinduism's most successful academic journals, with articles that are used as required reading in universities worldwide. It's focus is on the many Vaishnava lineages of India, including cutting-edge research by leading scholars in the field. Culled from the vast JVS archives, the present volume offers a variety of well-informed papers on the history, philosophy, and cultures of the Gaudiya Vaishnava tradition. It also explores this tradition's contemporary and most far-reaching manifesatation: the International Society for Krishna Consciousness (ISKCON). Thus, the insightful articles found here unveil the many layers of the rich theistic tradition known through the world as "the Hare Krishna Movement." Steven J. Rosen (Satyajara Dasa) is an initiated disciple of His Divine Grace A. C. Bhaktivedanta Swami Prabhupada. Rosen is founder and editor-in-chief of the journal of Vaishnava Studies, an academic periodical esteemed by scholars around the world, and associate editor of Back to Godhead, the magazine of the Hare Krishna Movement. His recent books include Essential Hinduism (Pager, 2006) and Black Lotus: The Spiritual Journey of an Urban mystic (Hari-Nama Press, 2007). I was introduced to Gaudiya Vaishnavism in 1972. At that time I had been searching for religious "Truth" for several years and concluded that I was particularly interested in the East. All the major religions, I religions- all originated east of my native Brooklyn, and then some. More, I wanted to know the source of religious truth. Islam, originating with Mohammed, was only 1300 years old, and Christianity went back only to Christ. Judaism began around 4500 years ago, with Abraham, and Buddhism is some 2000 years after that, arising with the appearance of Siddhartha Gautama. But here's something that really intrigued me: Hinduism's origins simply can't be traced to a particular point in time, nor does it have a "founder" in the sense that those other religions do. I soon discovered that Hinduism in an umbrella term for numerous religious traditions, such as Shaktism, Shaivism, and yes, Vaishnavism. Since I was introduced to this latter tradition by one of its most accomplished are pure adherents, His Divine Grace A. C. Bhaktivedanta Swami Prabhupada, I became especially enamored with Vaishnavism and its teachings. This fascination increased when I realized that Vaishnavism was identified as Sanatana Dharma, or "the eternal function of the soul." This was exactly what I was looking for. I wasn't interested in one religion as opposed to another, or the sectarian form of belief that creates one-upmanship and war. Rather, I was looking for the essential thread that ties all religion together, the mystical truth that fosters love, compassion, and understanding. What I wanted was the science of God consciousness. As I started to practice and study, I found that the origins and philosophical underpinnings of the tradition were a lot more complex than I had initially thought, and so I became involved in the academic study of religion in general and that of Vaishnavism in particular. In due course, I published a book of conversations with leading scholars in the field, Vaisnavism: Contemporary Scholars Discuss the Gaudiya Tradition (New York: FOLK Books, 1992; reprint, New Delhi: Motilal Banarsidass, 1994). This book led to the creation of a scholarly journal. 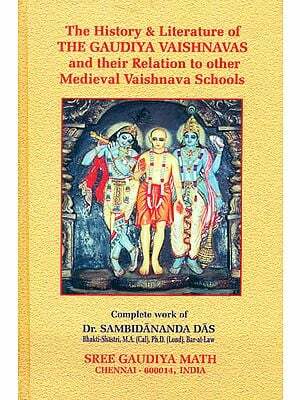 The journal of Vaishnava Studies (JVS), which is now the leading academic resource for scholars of Vaishnavism around the world. Its articles are used in Hindu-related courses at universities as prestigious as Yale, Harvard, Cambridge, and Oxford, and they are cited by every major scholar in the field, both in their published works and as references for students to pursue higher studies. 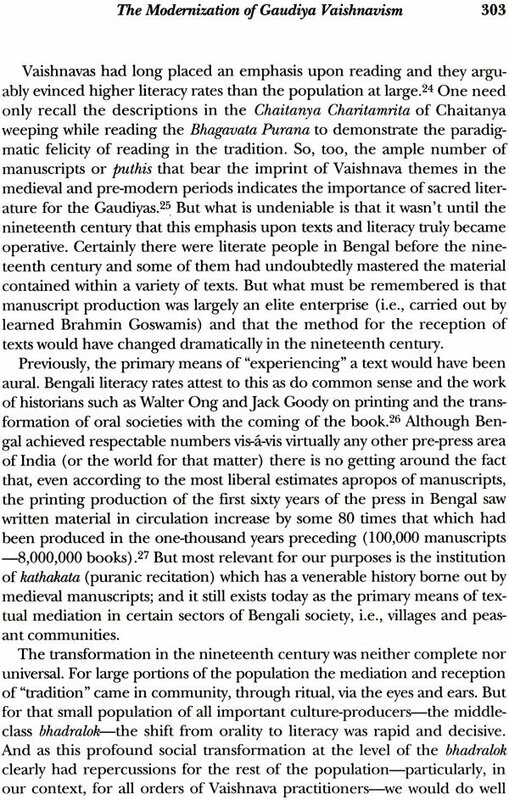 Each issue is book-length and thematic, with scholars of Vaishnavism and Vaishnava scholars- tremendously gifted researchers, writers, linguists, and philosophers and historians- contributing regularly. Subjects covered range from goddess in the Vaishnava tradition to famous temple from ancient times to the present; from Vedic texts, like the Upanishads, to the Bhagavad-gita and regional-language works of latter day Vaishnvism; from biographical sketches of important sages to translations of short texts and explorations of mystical states. Since my own particular interest is Gaudiya Vaishnavism, even moreso than Vaishnavism in general, I have naturally, over the years, sought out Gaudiya Vaishnava perspectives for JVS (with more enthusiasm, I admit, than those covering other forms of Vaishnavism). Whether our focus was on Ramanuja's tradition, Madhva's, the study of ethics in Vaishnava thinking, the Bhagavata Purana, or what have you, I was always interested in finding scholars who would contribute articles from the Gaudiya point of view. 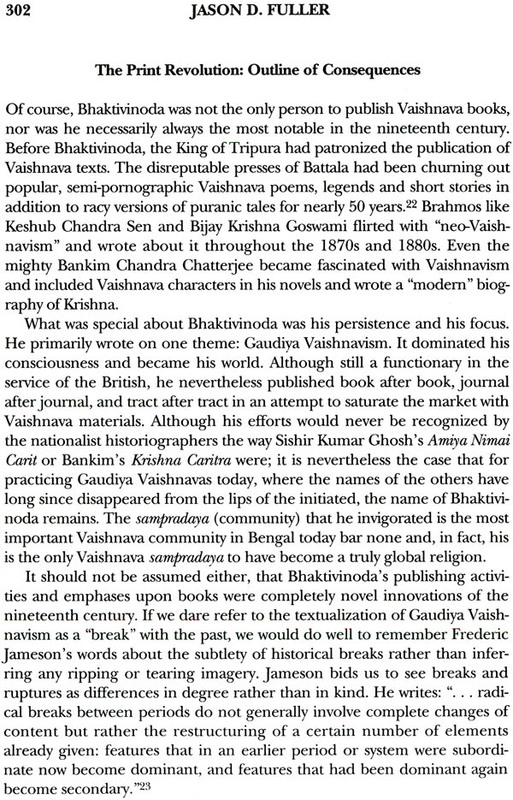 However, since these articles were printed alongside others (with the exception of Volume 5, Number 1, focusing on the Gaudiya tradition), I thought it useful to create a single volume that includes the best of our Gaudiya essays, along with a culminating section on the International Society for Krishna Consciousness (ISKCON), which is Gaudiya Vaishnavism's most visible manifestation in the modern world. Most of these latter essays are taken from JVS, Volume 6, and Number 2, which focused on ISKCON. Thus, the volume you now hold in your hands is the best of JVS, at least in relation to Chaitanya Mahaprabhu's brand of Vaishnava thought. Part I will deal with Gaudiya Vaishnavism as it is traditionally understood and Part II with ISKCON. The essays begin with my own overview of the Gaudiya tradition, entitled. "The Meaning of Gaudiya Vaishnavism," and is followed by Norvin Hein's now classic article on Sri Chaitanya and the theology of the holy name, so central to Vaishnava thought. After this, to bring the point home, as it were, is Acyutananda Dasa's article on changing as well. What Hein's article did for the academic community, Acyutananda's did for the society of Gaudiya devotees in the West. From this we move to Howard Resnick's (Hrdayananda Goswami's) through look at the Bhagavad-gita, which establishes Krishna as the Supreme Personality of Godhead, at least in terms of scriptural evidence. The other important Vaishnava scripture is the Bhagavata Purana (Srimad Bhagavatam), and Barbara Holdrege shows in her paper how highly regarded this text really is. She shows that, for Vaishnavas, this work is actually sruti- that is to say, it is brought further in the next paper, written by Travis Chilcott, who argues, on the basis of Krishnadasa Kaviraja Goswami's Sri Bhagavatam is, indeed, the best of all scriptures. A new direction is taken by June McDaniel, who shows convincing parallels between Gaudiya Vaishnavism and Catholic mysticism, especially in relation to love poetry and enhanced states of spiritual ecstasy. The science of such ecstasy is then analytically broken down by Neal Delmonico, who looks at Rupa Goswami's Bhakti-Rasa Theory, which is at the heart of the devotional process inaugurated by Chaitanya Mahaprabhu. The love and devotion that is analyzed in the Bhakti-Rasa theory is experienced, on a practical level, by the highest devotees of the Lord, most notably, the gopis, the cowherd maidens of Vraja, whose very purpose for being is Krishna Himself. Their high level of devotion is studied in Eric Huberman's article and elaborated upon in the one that follows- Graham Schweig's analysis of the Rasa-lila Pancadhyaya, or the five chapters of the Bhagavatam dealing with the Round Dance of Sri Krishna and the gopis, in which transcendent love reaches its most intense manifestation. To understand this love in a more intimate way, two articles look at the person who loves Krishna most: Sri Radha. It is she who embodies spiritual devotion like no other. As krishna's female half, she is God in softer form, as perfect devotee. 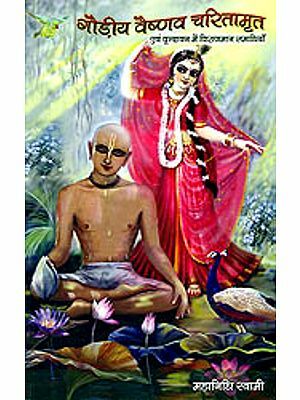 Ravindra Svarupa Dasa offers a deeply philosophical look at Radha, along with her unique status as Krishna's supreme devotee and how this impacts on the life and identity of Chaitanya Mahaprabhu, who, according to Gaudiya doctrine, is actually Radha and Krishna is one form. This is followed by Donna Wulff's in depth treatment of Radha as she appears in the plays of Rupa Goswami, revealing still more intimate sides of her personality. Finally, Jason D. Fuller brings us into the world of Bhakti vinode Thakura, grate saint and intellectual of the nineteenth century Gaudiya tradition. Bhaktivinode's engagement of modernity and practical devotion inform all aspects of Vaishnavism in the contemporary world. The exploration of this personality and his teachings, of course, will act as a segue to Part II, which is about ISKCON.